Education: I have multi disciplinary educational background in Chemistry (BSc) Environmental Science (MSc) & Earth observation and Geo-Information science for environmental Modelling and management (MSc). 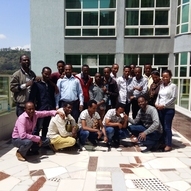 I have experience in carrying out trainings, environmental research both in Ethiopia and in the Netherlands. My areas of expertise are environmental management, water quality, natural resource management, Remote sensing image analysis and GIS.